Paper dispensers are not something that we commonly think about, that is of course, until we need them. Paper towel dispensers are what their name signifies, something to hold and dispense our paper towels for us. If you have a public restaurant, restroom, washroom or shower a paper dispenser is essential and will be one of the most commonly used fixtures in your establishment. Paper dispensers is a term that covers a wide array of fixtures. A paper dispenser can come in many shapes and sizes, from an automatic, surface mounted, industrial sized device all the way down to a simple stainless steel napkin holder for your table or countertop surface. There are many various kinds of paper dispensers available today, the multitude of options can make choosing just one seem very intimidating. That is why it is important to determine your needs and focus on what is best for your established. Here at Paperdispensers.com we are focused on helping you make the right decision. Throughout this site, we will provide you with the pros, cons and any additional information available to help you make an informed decision before you purchase a paper dispenser, napkin vendor or sanitary waste disposal unit. Once you know the basic features your establishment needs, it is time to move on to examining the physical aspects in deciding what looks good in your restroom or washroom. Find a place where you can mount your new paper dispenser. Remember, it is important that the dispenser be easily accessible when it is needed. Depending on the layout of your bathroom, you want to get it as close to the sink or basin as possible. Here's another tip: if you have a big bathroom for space is not a concern, go for a dual paper towel dispenser, it will require less trips to replace the paper towels. Once you have an idea of where you're going to place your paper dispenser and how much space you have available, you will need to decide on the shape, size and design that you need. The wide array of paper dispensers that are available on the market are available in multiple mounting options. It is necessary to decide if you want the unit to be surface mounted, or do you want it to be recessed into the wall? Recessed units can be more difficult to install because a hole must be cut into the wall in order to place the dispenser. These are just a few of the things that need to be considered before buying your paper towel or napkin dispenser. Once you have decided on the look of your dispenser and designated a place to put it, it is time to determine which type will actually fit your customers needs. The main consideration is the amount of toilet paper that will be used in your establishment. Do you need a dispenser that uses a roll that keeps on growing smaller with usage? Perhaps you need a dispenser that dispenses individual folded paper towels. Maybe you just need a napkin dispenser to place on the tables or countertops of your establishment. For example if your building has a high-traffic restroom we recommend that you use a dispenser that accommodates a larger paper towel roll. This type of unit requires less maintenance because the roll doesn't have to be changed out as often. Most paper towel dispensers can be configured to control the amount of paper towel dispensed. What is important here is to realize the amount of paper towel that is needed, neither should there be two less or too much. Experimentation will help you to determine a fair amount to dispense so that the user gets enough paper towel, but not an excessive amount. Also, there are many units that hold two rolls which allow the second roll to slide into place once the first roll is finished. 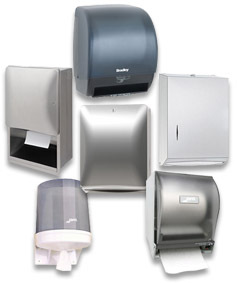 Paper towel dispensers are available in a wide array of eye–catching designs and shapes. Furthermore, the right paper towel dispenser can accentuate the decor of the room. Remember to do your research because there is a huge difference between the companies that make paper towel dispensers.